Well let's all admit it right now. Yes, BEA is about networking and meeting bloggers/authors, finding out the next trend in the publishing industry but the truth is we go for the free books. I didn't do an exact count but I got about 46 books on Tuesday and another 40-ish on Wednesday. I thought Thursday would be a light day since BEA closed early and I didn't have many signings scheduled but I ended up with another 30 or so books....so that's over 100. 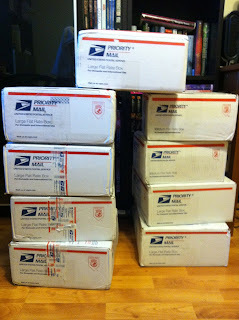 Here are the boxes - 9 in all - ready at my house when I got back. There are just waaaay too many for me to list them all but here are a few that I caught my attention. Tons of bookmarks, a few tattoos & t-shirts, pins, lots of bags that I didn't bother putting in the picture. 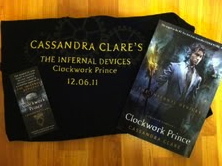 And here's some Clockwork Prince by Cassandra Clare swag from the big cover reveal event. 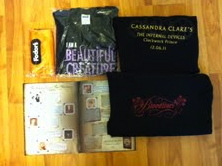 A t-shirt, Chapter Sampler and bookmark. I'll be doing a giveaway for this soon so check back. Next up! FOOD. Good lawd! Did I eat a lot while I was in NYC!! It might not all fit in one post. what a bunch of great books and swag. I love seeing all the books. Dude that's a lot of boxes o.o. I wonder what the delivery guys must have been thinking when they dropped them all at your house. Good lord, that's a lot of free books. And to think that I wonder what my mailman thinks when I get a package every day or two. 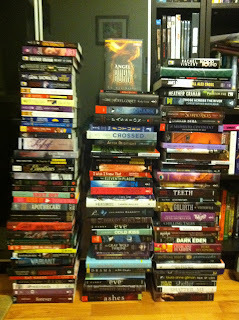 I cannot believe that disgustingly immense pile of books! I always thought the same as SusieBookworm. Lol. I'm glad you were able to get so much from BEA. It would be really amazing to go, I'm sure. DUDE. O-o I'm so jealous. It is seeping out of my belly button. THAT IS THE AMOUNT OF JEALOUSY YOU CREATE. Wow!! That is absolutely CRAZY!!!! I don't have a clue if I'll get THAT much at ALA, but I am planning on shipping it to myself, that's for sure. How much did all that cost, if I may ask? @Jessie - I used flat rate priority so that's about $14.95 I think for the large box but media mail is much cheaper. 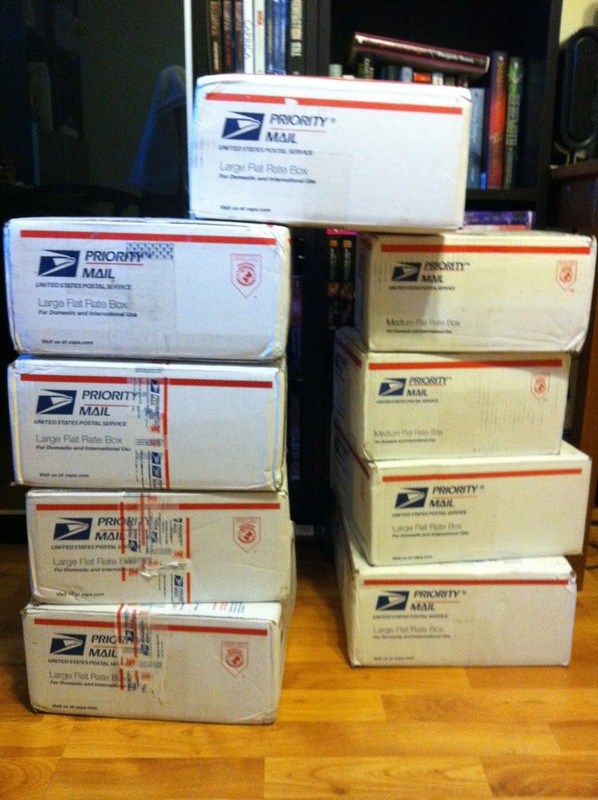 The priority supplies are free, you would have to buy the boxes/tape for the other types of shipping. I always bring a roll of shipping tape though. The cost of shipping at Javitts center is CRAZY so we go to the PO instead. Oh how wonderful for your - enjoy, enjoy, enjoy. What a great haul! That would make grin for awhile. The wisest move, in my humble opinion, was getting all those bookmarks. They're always needed and for some obscure reason they cost a fortune in the stores. Would you say BEA is a female thing? Or would there be enough there for the average male reader? @Marc - It is mostly a female thing but I saw more guys this year and IMO you might have a better time there than I since you are not in the chaotic mad dash for YA or paranormal. There are booths with publishers and signings all day for The Horror Writers, Mystery Writers Associations I saw more comic book publishers there this year too. These areas are less popular and therefore easier to access and actually spend time with the publishers/authors. Much more laid back. I sooooo hate you right now! I looked at that pile of books and started to pout. Times like this make me wish I lived in America. And I'm totally digging the CP swag! Holy crap! 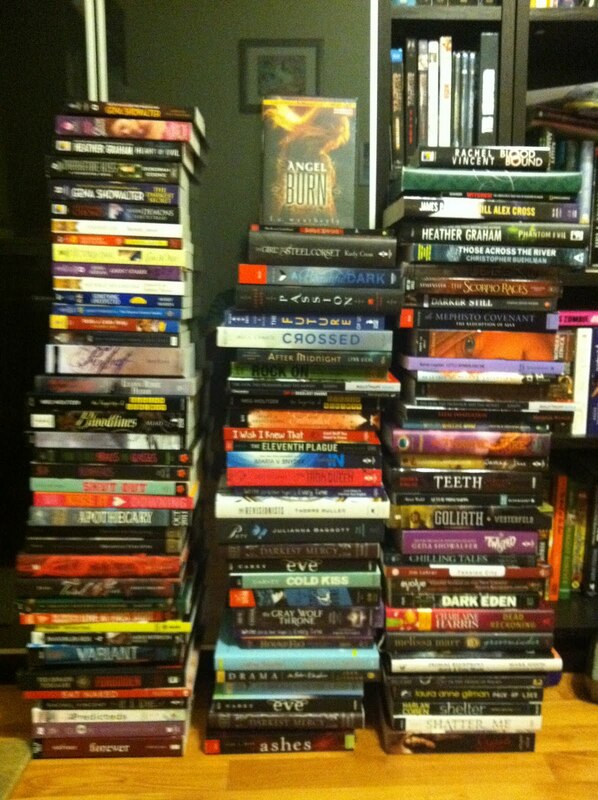 I have to admit, I'm extremely jealous of all those awesome books! Glad you had a good time though! Ooooh myyyy gosh!!! I'm assumming here, and I could be wrong...but those are free with admission to the convention? wow! !